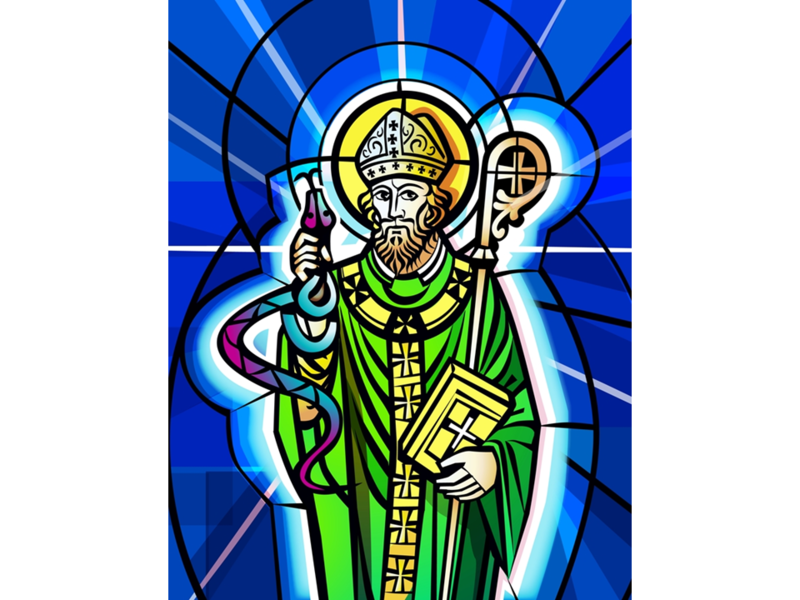 When I was young, I imagined myself as Saint Patrick. So Patrick became my Confirmation name. However, as I grew older, I accepted the thought of being a saint as delusional. Given the modern definition of the word, I suppose that’s understandable. After I die, I do not expect anyone to seriously suggest that I be canonized. Although some translations the Bible do make use of it, there is another usage of the term the dictionary does not endorse. For example, to refer to the Lord’s People or believers, the King James Version of the Bible uses the term “saint” in some form over ninety times. Look at the way the Bible portrays the people it calls saints. It does so with all their warts and blemishes. Only Jesus, God made man — our savior, lived a perfectly holy life. The saints, the believers, struggled for holiness, and they often failed. So what made them saints? The Online Etymology Dictionary tells the origin of the word saint. It has the same origin as the word sanctify. The saints attempted to consecrate (or dedicate) their lives to God. That is, they set out to live as they believed God would have them live, and they asked Jesus to help them overcome their sinful nature. Christianity. Consider the rats in the cellar. When I come to my evening prayers and try to reckon up the sins of the day, nine times out of ten the most obvious one is some sin against charity; I have sulked or snapped or sneered or snubbed or stormed. And the excuse that immediately springs to my mind is that the provocation was so sudden and unexpected; I was caught off my guard, I had not time to collect myself. Now that may be an extenuating circumstance as regards those particular acts: they would obviously be worse if they had been deliberate and premeditated. On the other hand, surely what a man does when he is taken off guard is the best evidence for what sort of man he is? Surely what pops out before the man has time to put on a disguise is the truth? If there are rats in a cellar you are most likely to see them if you go in very suddenly. But the suddenness does not create the rats: it only prevents them from hiding. In the same way the suddenness of the provocation does not make me an ill-tempered man; it only shows me what an ill-tempered man I am. Each of us has rats in the cellar. Every day I live I sin. Perhaps the great sinners are people who sin without compulsion. Perhaps such sin with the malice of forethought. Yet with little temptation, I do what I should not do. I will speed down the road with a cell phone, I will cuss the fool, or with ten items I will step into a grocery store checkout line that allows only seven items. Small things? Perhaps, but will God see it that way? Even in small matters, God has reason to expect honesty and goodness. So we must each work to be saintly and one of our Lord’s people. And sometimes we use our judgement of others to justify actions that God would find most horrific – namely human slaughter. Be careful of overconfidence in your own judgement of others – it may lead to your own downfall. Still sniping Eric? Remember when you quoted this verse? “Do not give dogs what is sacred; do not throw your pearls to pigs. If you do, they may trample them under their feet, and then turn and tear you to pieces. Sometimes we must judge others. Sometimes we must defend what sacred. Sometimes we must reserve our pearls for who will not trample them. Yet someone is always stronger, even a strong man can be overcome. So we must take up the armor of God. And no, He does not want us take up arms in His name, but He does want us to do what is right. Sorry, you lost me here. I can not accept that He ever wishes us to “take up arms” especially in His name. Happy 4th of July Tom. This blog sure gave me lots to think about today. If we don’t return to God, as a nation, everything we have done so far, with be for nothing. Thank you, and Happy 4th of July to you! That reminds me. I have got to go put the Stars and Stripes up. Weight of the world? I hope not, but I suppose it makes sense to see this post that way. I intended it as a act of repentance, and I do worry. I thank you for your concern. What is wrong with preaching on a post about religion? Until he had a revelation, Martin Luther worried he could never measure up; he could never be perfect. From the Bible Luther preached. Luther pointed to the Bible, and he said it says we are justified by faith. To be saved is to accept the gift of the salvation from Jesus, and to have faith in Christ Jesus. Even so, there is a heavy price. We must admit God died for us. We must admit we sin, and we must repent. God will not accept us unless we become holy. I wonder if He can. Can anything less than another holy being survive the full knowledge what it means to be perfectly holy? Therefore, Jesus gave us something we can do. We can make a choice. We can remain enslaved by sin, or we become the freed slaves of God. We can die, or we accept eternal life. To be saints, we just have to strive to be good. With God’s help we can become perfect. Some day. Some how. I worry about that some how. Me? Perfect? God is God. If He can make me holy, then he must be God. Is it more important to be saintly and try to live a sin free life than it is to give thanks to God for sending His Son to die for those sins? If we accept that Jesus gave his life for us, can we not accept that he knew that we could not be perfect and that the blood that He shed is what will protect us? I am not saying that we shouldn’t try to live without sin, I am saying that it is impossible and God knows that. We are going to falter, and it is important to accept that and give thanks to God for loving us enough to give His Son. He doesn’t expect us to solve the worlds problems, or even always solve our own. What He does want is us to give them to Him, because after all He has promised to take care of us! What the world does and how it goes are things that we can pray about, inform others about, advocate for change, and sometimes take up arms. But ultimately, it is in God’s hand and we know that He knows the end and that He is still in control. When you know that, what need is there to worry so much? There is a great deal of peace in knowing that you don’t have to solve the worlds problems and that when you reach your limit, God will be there to take over. Does that mean that we will not have problems? No, it just means that in the end, God wins, and when you come down to it, isn’t that all that really matters? I didn’t mean to preach, but you seem as if the weight of the world is on your shoulders.